It almost seems like the words "nursing room" and "politics" do not belong in the same sentence. In a perfect world we would not have to think twice about why and how we should provide nursing rooms to mom who need to breastfeed or breast pump. In a perfect world it would not be political. Society as a whole would recognize it as an human necessity, like we do bathrooms and not think it's ok to breastfeed or pump in a bathroom to boot. But we don't live in a perfect world and some how we need to rely on political leaders to make these decisions for the public. Thankfully we have the right people in place in New York City to help nursing rooms become an accepted piece of our culture. 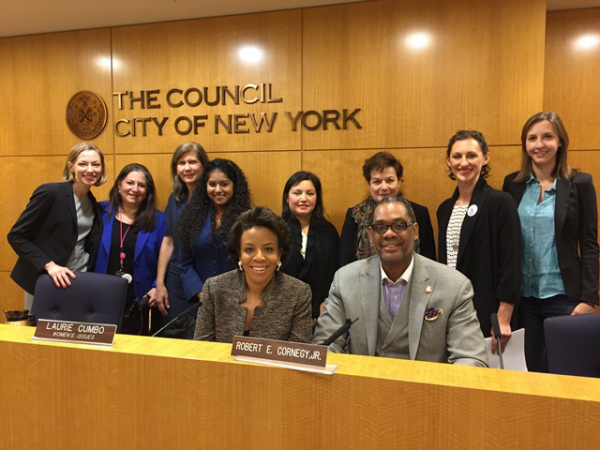 On Wednesday, March 30th, the NYC Committee on Women's Issues convened to discuss amendment of the city's administrative code "requiring lactation rooms in certain public spaces." Under the leadership of Chair Laurie Cumbo the amendment will require the New York City Department of Health and Mental Hygiene, several types of centers in the city, such as health centers, human resource centers, Medicaid offices and more to provide nursing rooms on site. Ironically this was also sparked by a man and father, Council member Robert E. Cornegy, Jr. He shared his experience as his wife breastfed his twin sons and an experience he had traveling to Taiwan where nursing rooms are commonplace. Outside of the United States and in popular Asian countries it is very common place to see nursing room locations (not family bathrooms) available for moms to breastfeed and breast pump. In addition to local politicians several organizations testified in support of the amendment. They shared facts and figures supporting the importance of breastfeeding and why some women are forced to stop breastfeeding due to a lack of resources and opportunities. Some expressed concern for safety and messaging but overall there was a consensus nursing rooms should be mandated. One particular group, Mother's Milk Bank Northeast, represented by Amber Star Merkens, New York Outreach Coordinator, testified in favor of the amendment citing breast milk statistics. The Milk Bank is a non-profit organization with several locations in the North Eastern United States where mothers can donate breast milk and also receive breast milk for their babies. Amber shared her personal experience with her premature child and having to breast pump for her baby to make sure she had the necessary nutrients to grow. She traveled back and forth to the hospital for 6 months, on the go pumping. There was a lack of nursing locations she could use and it made it difficult to manage her liquid gold. Currently Moms Pump Here has about 70 locations in the NYC area and 2,000 worldwide. We have several of the politicians' offices listed as nursing room locations on the Moms Pump Here Nursing Room Locator App, in addition to retail stores, parks, doctors' offices, airports and more. AND we do have nursing room locations in Asia. We hope the amendment does not get dragged through red tape and some real change happens soon for nursing moms in the city. In the mean time moms can use our App to find nursing room locations to breastfeed and breast pump! I'm a Mom of 3, serial entrepreneur, love my planet, love adventure, and want to change the world. The sky's not the limit, the universe is the limit.